PD Ports has announced an all-time record in container volumes handled at Teesport. This new record comes at a time when the Department for International Trade published its annual maritime statistics confirming Teesport, one of the deepest water ports on the east coast of England, experienced an overall volume increase higher than any other UK port in 2017. A significant driver in this reported growth is the increasing number of containers and trailers shipped from the continent to Teesport with 54,400 TEU (Twenty Foot Equivalent Unit) handled in October, the highest on record, following an exceptional five-week period in September. At a time of the year in which ports usually see a reduction in volumes ahead of the Christmas peak, Teesport experienced its busiest month to date. 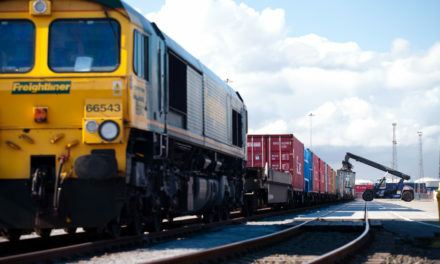 The growth in this sector has been supported by additional vessels now calling at Teesport from shipping lines A2B-online, Containerships and Unifeeder providing increased frequency and further connections to Botlek and Dunkerque, an uplift in ferry volumes and exceptional performance at its intermodal rail terminal have been instrumental in driving further growth in this key sector. Significant investment in a fifth ship-to-shore crane and three RTG (Rubber Tyre Gantry) cranes in the last two years has been fundamental to the Port’s ability to be able to support the growth in volumes at the container terminal. Over £1billion of investment has been attracted and secured by both PD Ports and third parties over the last 10 years to underpin growth and development positioning Teesport as the UK’s northern gateway for international trade. Frans Calje, PD Ports’ CEO, commented on the record four-week period: “These results of huge significance not just for Teesport but the wider Tees Valley region. It represents the immense confidence and trust global shippers have in the Port to deliver peace of mind with flexibility and efficiency unlike other congested UK and European hub ports.